This HFT strategy is a trend following system. Based on pullbacks and volatile markets. Very accurate and very high RR ratio. Time Frame: 1 minute only! Stop loss is 1 pip above/below previous candle. Target is 80 pips. Move SL to breakeven after 20 pips. Move SL to +20 after 40 pips. Move SL to +40 after 60 pips until 80 pips is hit. wait for the new trend change. No matter how many pips you earned. When greedy, it will fill your broker. In the pictures IAB HTF Strategy in action. I deleted the file because it's not free. Can anyone who downloaded this system please email it to me at ogormanmatthew7@gmail.com. Thanks would be very much appreciated! Thanks. I cannot buy this system because I live in America. The company that owns this system is not allowed to sell to people in America. Can someone here who downloaded the system send it to me please? How can I get this system? Anybody knows? Hello Benjamin. Can i contact you about your strategy? I have some ideas. I think you will like it. Thank you for your time. Thank you so much for your amazing work. I noticed the indicator doesn't allow us to change colors, width, or style in the properties. Once I change the timeframe or currency, it goes back to the default. Could you fix this by any chance? Also, will you be uploading your new version mentioned on the website as well? Thank you! cau u add sound alert to lAB trend. mr benjamin? can you please add mq4 file of IAB trend and your website too!! thanks. Benjamin , some screenshots again , please ! Thanks for this great share man! I've tried it for 2 days nonstop. Today i tried it live. For the first time i tried a strategy live that actually delivers. 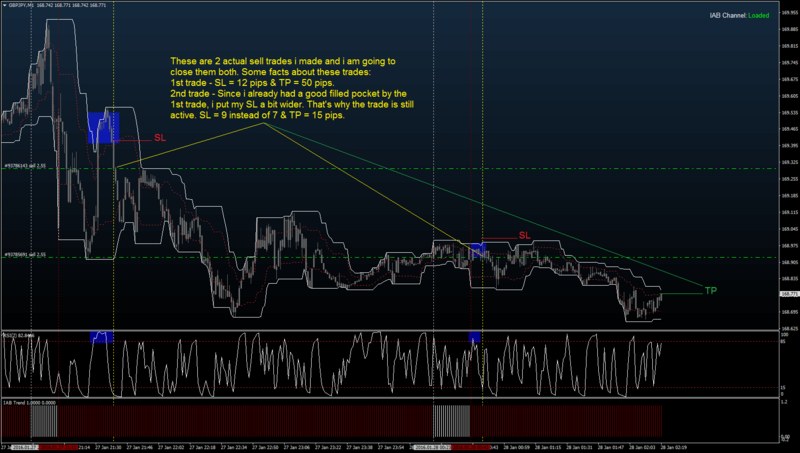 As the author, i had the balls to use a big lot because of the low risk. 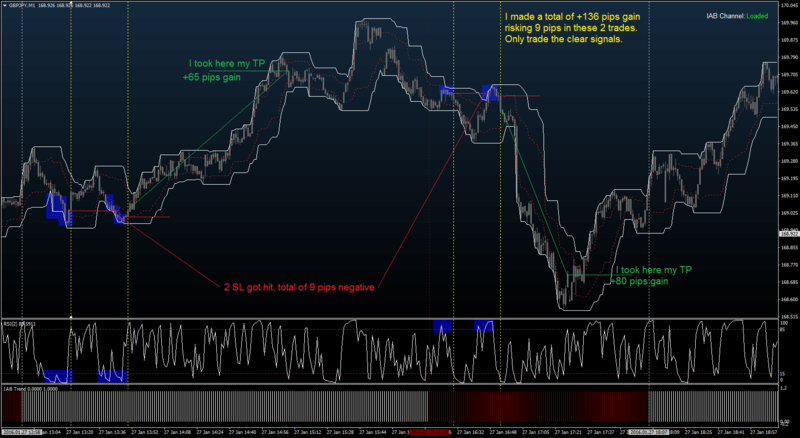 I used 1 lot on the eurusd and chickened out at + 30 pip in profit. Next trade was gbpchf and made + 62 pip and wasn't chicken haha. Then i saw the latest post of the author and quit on + 92 pip profit today. I will use the exact same style and mm approach. Hopefully i will continue to make almost $ 900 a day!! So thanks dude!! You have earned my respect and appreciation and many others will follow. I'm sure about that! Thanks for your advice and suggestions, they are very important for me. Many traders are interested in your system, maybe you could open a discussion on FF . Last thing , please put some more your live screenshots ! i cant attach the indicators to the chart, is there a possibility you could upload the finished templet with all the indicators? i would really appreciate that. OK Benjamin , thank you for kind replay . Me too believe that your own is a great system . But I think that the TP of 80 pips is a bit too much . 1M timeframe on Gbp/Jpy offers many possibilities of entries in a day , so we can satisfy for a more low target . 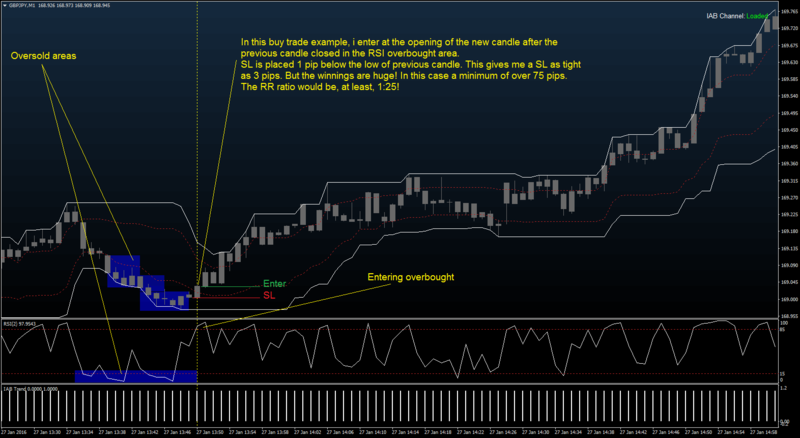 For example : 4 trades per day with each 20 pips ( but "only trade the clear signals" as you said ) = 80 pips a day : with an appropriate MM and with compounding we make a lot of money . Thank you and compliments . Hi Ben , to reduce the ( few ) false signals of your very good system , what do you think to use the 15M timeframe as filter ? 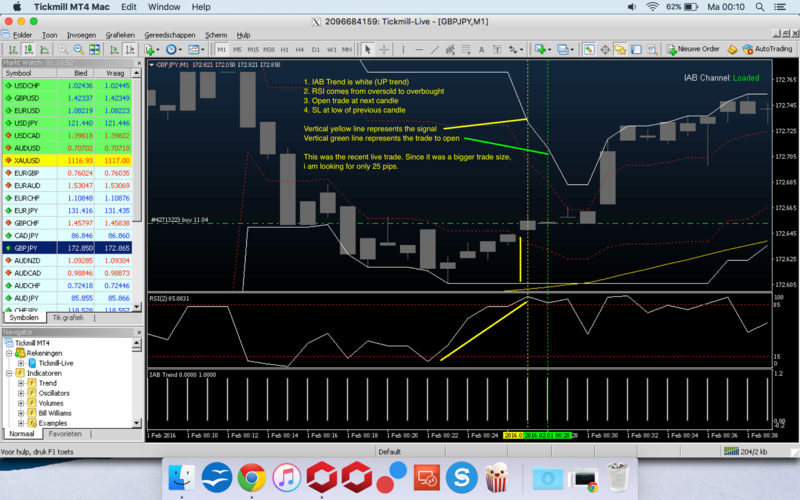 In other words, enter on 1M only in direction of IAB Trend indicator of 15M . Let me know , please . compliments for your interesting and very profitable system . Can you place here some more of your screenshots , with entries and your explanations ? 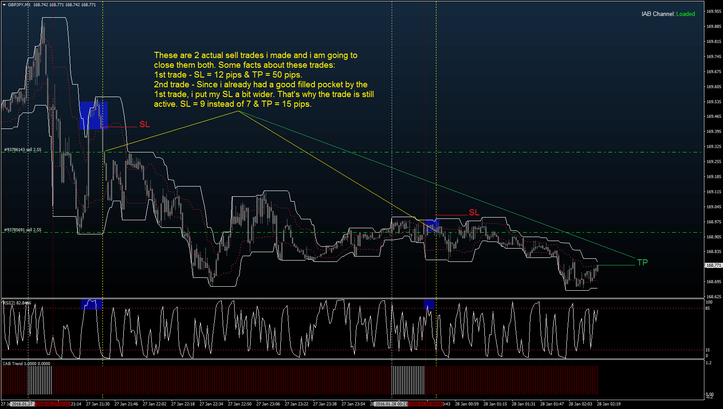 Hallo Benjamin , above you said " RSI (period 14) " , but in the screenshots the RSI have 2 period .